What is your favorite Disney movie? What about your favorite Disney song? We all have one, right? A special Disney song that brings back memories from our childhood—or memories from when our kids were little. I wanted to share a fun, nostalgic gift idea that I know my family must have: the new Disney Classics box set is set for release (today!) November 12, 2013! Just looking through the list of Disney songs brings back so many memories of when my girls were younger! The Disney Classics box set is the perfect nostalgic trip down memory lane—especially during the holidays. As our family heads into our busy holiday season of travels, get-togethers and hosted parties, we love to find things that get family conversations started and I think the Disney Classics set will certainly do just that! The Bare Necessities…..who didn’t love that “silly old bear” as my daughter called him, from The Jungle Book. A Spoonful of Sugar…..I don’t necessarily remember it really helping the medicine go down…but, what mother hasn’t found herself singing this at some point? It's so much fun to watch everyone sing along, smile, and share music inspired memories! What memories are inspired by Disney songs for you? Disney has inspired so many magical moments—and lifelong memories. My daughters all wanted to be princesses….and my youngest wanted to be Brave. Of course, Disney magic is not just for children--I have a number of friends who incorporated Disney themes into weddings, graduations, and other special events. The Disney Classics Box Set puts all of those moments into one collectible set. 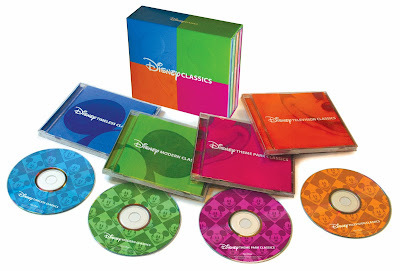 The Disney Classics Box Set included 4 cds of 94 original recording—with a list price of $49.98 (which will vary by retailer). You can buy it on Amazon.com or wherever music is sold. As a special bonus, box set purchasers will receive a new medley of Disney hits by YouTube a capella sensations Peter Hollens and Alex G. Peter and Alex create fully orchestrated songs using only the sounds of their voices. With well over 100 million views on YouTube alone, their sensational approach has excited audiences all over the world. Ready to relive the magical memories of Disney? Check out the Disney Classics Box Set.